Functions daily from 8.00-14.00 and covers the whole range of rheumatology disorders. Functions daily throughout the year. Patients are examined by the rheumatology trainee doctors and difficult cases are discussed in the presence of the director. 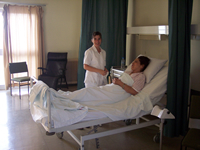 Patients who are admitted for in-patient treatment are examined in the out-patient clinic and on the ward. On the rheumatology ward there is a rheumatology specialist in charge as well as a specialist trainee doctor. 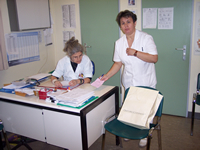 The patients are discussed daily and are managed by the ward doctors. 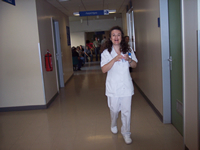 A Director/Professor ward round takes place daily between 10.00-11.30 whereas, difficult cases are discussed in the out-patient department daily between 11.30-14.00 when necessary. Trainee doctors have on-call duties in the Emergency Department for Internal Medicine as well as on the Rheumatology Ward.